First one of the year, and its one that is just a free-flow rant of several thoughts of the moment, based around a central idea of weed legalization that has been popping up as of late. It seems to be a hot button issue, depending on who you talk to, and everyone seems to feel strongly one way or another. Here’s my thoughts on the matter, with probably some hypocrisy tied into it. First off I want to state that I don’t do drugs. I tried marajuana once, and didn’t like it, and probably won’t do it again. I have never tried anything harder than that and there is a very strong probability that I never will. I don’t really drink either, that’s not to say that I don’t have a social drink now and then with friends, but for me, It’s just something I don’t do. Why? It’s not because of religion, mostly its because I just don’t feel like doing these things. This is also where my brain starts having a no holds barred cage match with itself too. Part of me thinks that I don’t want to dull my senses with needless things such as alcohol, weed, coke, etc because it seems like you are weaker if you have to do these things to find a sense of zen or relaxing. Then again, I am a recovering food addict that finds comfort in a good chocolate bar or ice cream, so I have my things I gravitate to find happiness in. I understand this though, and I fight them off as best as I can. I do believe that if you need drugs in your life to make it better, then there might be some things you need to work on. That’s not to say I look down on anyone who does this. If I shunned anyone who decided to drink to have fun, or took any kind of drug to unwind, I’d have no friends. I don’t think I’m better, because I know I’m not. I just have a sense that maybe we should try to find other outlets besides substances to find comfort. Ultimately I know that probably will never happen (in my lifetime at least). Now on to the subject of legalizing or decriminalizing Marijuana. Does Marijuana do less damage to a person than booze? Sure. Is there other medical benefits to the substance that could be used? Probably. 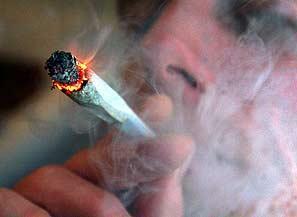 Should the laws be changed on the decriminalization of Marijuana? Absolutely. Someone with just a small amount for personal use should not see the same type of time as a guy with tons of the substance for the intended purpose of distribution, as opposed to the guy who has a small amount for just his own fun. I think that is the biggest change needed to be made. Make weed legal though? That’s a bigger question. I don’t think any drug should be legal, but I am an American that feels if you open one door, you need to open all. So if weed should be legal, so should Cocaine, Heroin, Meth, LSD, etc. Once again you can’t pick and choose which things should be allowed, and which ones should be left out. I’ll go back to my original thoughts that if weed becomes legal, in 50-60 years who is to say that Coke advocates wouldn’t have their protests promoting the benefits of blow? Don’t say that couldn’t happen either because look at how this country operates. So might as well make them all open and available now, and have systems in place to help people with addictions, just like you would with someone who is an Alcoholic, or addicted to prescription drugs. iscussion). Let’s just stop picking and choosing already. So I guess the point I’m hammering here is legalize it, but legalize ALL of it. If you feel like drinking yourself to death, smoking yourself to death, eating, shooting, snorting or whatever to death, go for it. I’m not your mom or dad, and people should be allowed to decide if they want to screw up their lives or not. Also, for you weed advocates or drug users that think that you have some bigger sense of the world because the drug has helped expand your mind, blow me. I’m tired of hearing about your special Alice in Wonderland journey of the mind that somehow makes you better than me now and I’m some silly idiot because I refuse to go down that path. Do what you do, and I’ll do what I do, and we both can meet up in the end as worm food when it’s all said and done.